JASON CONG received his B.S. degree in computer science from Peking University in 1985, his M.S. and Ph. D. degrees in computer science from the University of Illinois at Urbana-Champaign in 1987 and 1990, respectively. 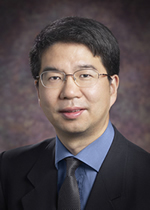 Currently, he is a Chancellor’s Professor at the Computer Science Department of University of California, Los Angeles, a co-director of the VLSI CAD Laboratory, and founding co-director of UCLA/Peking University Joint Research Institute in Science and Engineering. He also served as the chair of the Computer Science Department from 2005 to 2008. Dr. Cong’s research interests include computer-aided design of VLSI circuits and systems, design and synthesis of system-on-a-chip, programmable systems, novel computer architectures, nano-systems, and highly scalable algorithms. He has published over 280 research papers and led over 30 research projects supported by DARPA, NSF, SRC, and a number of industrial sponsors in these areas. He served on the technical program committees and executive committees of many conferences, such as ASPDAC, DAC, FPGA, ICCAD, ISCAS, ISPD, and ISLEPD, and several editorial boards, including the ACM Trans. on Design Automation of Electronic Systems and the IEEE Trans. on VLSI Systems. Dr. Cong served on the ACM SIGDA Advisory Board in 1993-99, the Board of Governors of the IEEE Circuits and Systems Society 2000-04, and been a guest professor at Peking University since 2000. Dr. Cong received a number of awards and recognitions, include the Best Graduate Award from Peking University in 1985, and the Ross J. Martin Award for Excellence in Research from the University of Illinois at Urbana-Champaign in 1989, the NSF Young Investigator Award in 1993, the Northrop Outstanding Junior Faculty Research Award from UCLA in 1993, the ACM/SIGDA Meritorious Service Award in 1998, and the SRC Technical Excellence Award in 2000. He also received four best paper awards—including the 1995 IEEE Trans. on CAD Best Paper Award, the 2005 International Symposium on Physical Design Best Paper Award, the 2005 ACM Transaction on Design Automation of Electronic Systems Best Paper Award, and the 2008 International Symposium on High Performance Computer Architecture (HPCA), respectively. He was elected to an IEEE Fellow in 2000 and ACM Fellow in 2008. Dr. Cong has served on the Technical Advisory Board of a number of EDA and silicon IP companies, including Atrenta, eASIC, Get2Chip, Magma Design Automation, and Ultima Interconnect Technologies. He was the founder and president of Aplus Design Technologies, Inc., until it was acquired by Magma Design Automation in 2003. He served as the Chief Technology Advisor of Magma from 2003 to 2008. Currently, he is the Chief Technology Advisor for AutoESL Design Technologies, Inc., a recent start-up that licensed UCLA research in the area of high-level and system-level synthesis for electronic systems for commercialization. Dr. Cong has graduated 24 PhD students. A number of them are now faculty members in major research universities, including Georgia Tech., Purdue, SUNY Binghamton, UCLA, UIUC, and UT Austin. Others are taking key R&D or management positions in major EDA/computer/semiconductor companies, such as Broadcom, Cadence, IBM, Intel, Magma, and Synopsys, or being founding members of high-tech startups, such as Aplus and AutoESL Design Technologies.